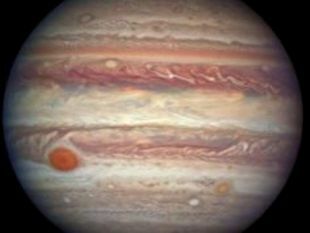 Planetary gas giants have epic storms, as everybody and his dog knows from Jupiter’s Great Red Spot, a vast anticyclonic storm with a bigger diameter than Earth. That red spot has been there for at least 190 years, and possibly 350 or more. It may actually have been spotted by the English proto-scientist Robert Hook in 1664, or not. But the solid planets have their weather issues too, and now the Hubble Space Telescope has caught footage of the actual formation of a gigantic storm in space, this time on Neptune. Pictures of the storm were published Monday in Geophysical Research Letters by lead author Amy Simon, a planetary scientist at NASA’s Goddard Space Flight Center in Maryland and the team. It is the first time that astronomers have spotted the formation of a Great Dark Spot on Neptune, Simon says. Actually the spot was first observed in 2018 but is only now being reported. Though Neptune is an ice giant, not a gas one, and is dense to boot – storms on in the Neptunian atmosphere form like the Red Spot arose on Jupiter: areas of high atmospheric pressure deep in Neptune’s atmosphere, says the team. On Earth, storms famously form around areas of low pressure. Why exactly are we comparing storms on Jupiter with storms on Neptune, given that the first is a gas giant and the second an ice giant? “Because the storms are formed by the same mechanism,” Lauren Lipuma of the American Geophysical Union explains to Haaretz. Even if it has ice at its core, while Jupiter isn’t thought to: “Neptune has a thick gas atmosphere that allows these storms to form,” she says. Neptune has quite the weather issue. Six dark spots have been observed there so far: The Voyager 2 spacecraft saw two in 1989, and Hubble, launched in 1990, has spotted four more. Understanding blueish Neptune is probably a good way to start. If the Earth is 150 million kilometers from the sun, and Jupiter is almost 780 million kilometers, Neptune is a far, far 4.5 billion kilometers. It is very cold out there. In contrast to the Great Red Spot, the storms on Neptune may be foul, but they are relatively fleeting. That one on Jupiter has been there for centuries, at least: two seen on Neptune by Voyager 2, the Great Dark Spot – which was the size of Earth – and Dark Spot 2, which was smaller than our wee planet, had passed within five years. The Neptunian skies have high-altitude clouds not made of water vapor but of methane ice crystals. Scientists suspect these methane clouds accompany the storms that form the dark spots on Neptune, hovering above them the way lenticular clouds cap tall mountains on Earth, says the American Geophysical Union: Simon and co-authors Michael Wong and Andrew Hsu at Berkeley found that the clouds were brightest just before the giant storms formed. By the standards of the giants, the storms on Earth are fleeting: If one sticks around for a week, we worry, and our storms do seem to be moving more slowly thanks to climate change. 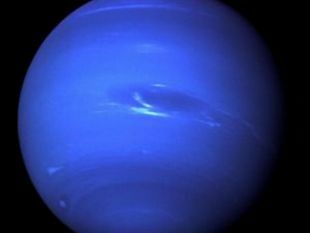 The scientists calculate that storms on Neptune typically last two to six years. But then our orbital period – our year – is 365 days, fleeting compared with Neptune’s, which is 60,225 days (165 years by our count). That planet is not rotating at warp speed. Many questions remain, but as storms on Earth pick up in intensity thanks to global warming, inquiring minds (at NASA at least) wonder about wind velocities in Neptunian storms. “We have never directly measured winds within Neptune’s dark vortices, but we estimate the wind speeds are in the ballpark of 328 feet (100 meters) per second, quite similar to wind speeds within Jupiter’s Great Red Spot,” said Wong. That is a lot faster than wind speeds here.